Endurance, performance and pure enjoyment always improves when I workout or do some sports activities with headphones and music in my ear. Whether you listen to classical or Electronic Dance Music, you’ll find yourself playing or exercising harder and longer with wireless Bluetooth headphones designed for sports. If that sounds good, we’ll get started! The Hussar over the ear hooks are just the best! You can find plenty of Bluetooth earbuds that sound good — while they’re in your ear? On the other hand, you will never worry about having to stop to fidget with these Magicbuds while you’re trying to exercise or workout. The over the ear hooks keep you listening. Sound quality is key for any headphones I purchase, and these sound great. I get great sound with a deep base and crystal clear trebles. In fact, I don’t find much difference in sound quality from much more expensive brands. Ever get tired of remote controls flopping around your neck and face? You will enjoy the controls here, with them built right into to the headphone earbuds. I have no trouble finding them when I’m running, or playing sports with my kids. They’re easy to find and skip, adjust volume, or rewind right at my fingertips. Hussar is one of the best designed earbuds on the market. They are black and red, lightweight, durable, rain and sweat proof — with a great sound for much less money than some more well know brands. 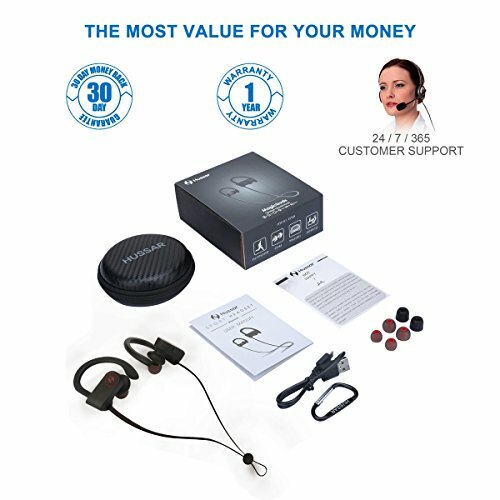 These Headphones come with a built in microphone that makes it easy to answer any incoming calls. The Bluetooth 4.1 brings with it improved sound quality and longer battery life for the earbuds and the phone. Universal Connectivity for seamless syncing. Connects to iPhones, iPads, Androids and Window phones for more than 33 feet. Over The Ear Hooks. Nothing is more frustrating to me than trying to exercise, workout, run, cycle or any sports activity — and have to either fight with earbuds staying in my ear. Hussar headphones stops all of that with secure fit magicbuds and over the ear hooks with real comfort that’s comfortable. Sweat Proof and Waterproof. Hussar bluetooth headphones are made with sports and athletes in mind. They are made with the best waterproof coating available and tight seems to ensure you never have to worry about sweat from working out, or getting caught in the rain when you’re running. Great Microphone Built Into Earpiece. When you’re listening to your favorite tunes and the phone rings, these headphones pause the music automatically if you answer the call with a push of a button and be pleasantly surprised at the sound quality. Easily adjust the volume on the ear piece itself with the touch of your finger. Noise Cancelling Too Good? The noise cancelling is so great that it blocks out just about everything from outside. Is this a problem? It could be a problem if you’re running, cycling, or doing anything where you need to hear what’s going on in the world. Of course the easy fix is to simply loosen one earbud a little when you need to hear outside noises. Over The Ear Hooks Are Soft. I consider these to be the best bluetooth headphones I’ve used and worn. However, I do read in the Amazon Reviews that a very, very low percentage of people say the ear hook needs to be more rigid? I personally find the soft pliable material very comfortable and easy to form to my own ears for a great fit. Not For Swimming. Hussar headphones are indeed waterproof when it comes to being active in the rain or sweating during sports activities or working out at the gym. THEY ARE NOT designed to wear in the swimming pool. And they are not advertised as such. To be perfectly honest with you, I don’t know how long Hussar as been around. I know I first fell in love with there Bluetooth headphones in 2016, and still consider them to be the best set of sport earbuds for the money. I know the company was founded in California, and continues to offer outstanding customer service to go along with their high quality products. You get a 30 day warranty through Amazon, and then 12 months through Hussar for any defects in materials. Just be sure to hold on to your Amazon order # along with the product model number. 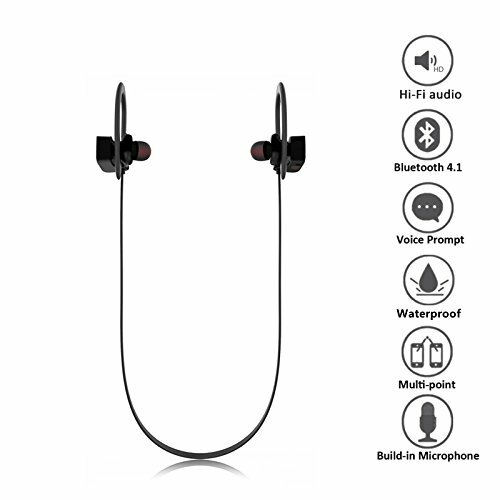 A highly rated product with 6000 Amazon customer reviews and a solid 4 star rating — this set of wireless Bluetooth headphones is highly recommended. One verified customer calls these headphones FANTASTIC! He reports that they are great about holding a charge for several days of partial use, and that they have plenty of volume with no distortion. He says they are quite comfortable and feel good while he’s exercising with no sign of damage from either rain or sweat. He likes the Hussar Bluetooth range and the fact that he can connect them to several different devices at once. Like everyone, he enjoys the carrying case and thinks they are the best value sport BT headphones. Here’s a different Amazon verified user who says they are the most comfortable over several hours of wearing while sweating through a hiking adventure. This reviewer says that the sound quality is so good that he is extremely impressed! 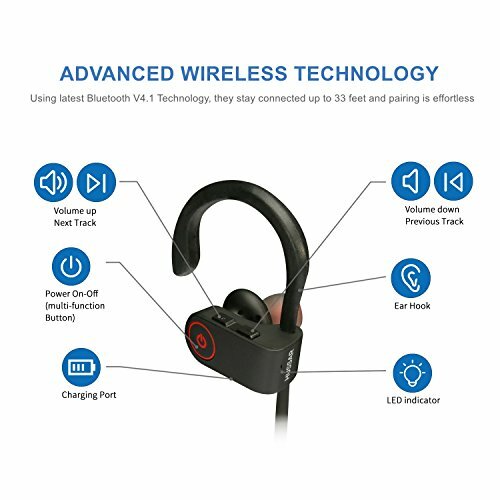 These Bluetooth headphones are so comfortable for him that he doesn’t even take them off when he’s at his computer writing his review. He mentions that they are light, fit well, with some of the best noise cancelling and audio he’s had — and that makes the price even better. Another reviewer reminds us about the microphone being built into the earpiece, and how when you’re listening to music and the phone chimes in the music automatically pauses if you answer. She also is pleasantly surprised about the clarity of the microphone. If you’re in the market for affordable wireless Bluetooth headphones made specifically with working out in the gym, running, walking, hiking, cycling, most any type of exercise or impact sports, you’re at the right place. The Hussar Bluetooth Headphones are some of the best you can find anywhere at a price affordable to most anyone without paying for a brand name. They are designed and built for great sound performance and reliability for active people who enjoy listening to their favorite music on the go. They come with a carrying case to keep them from getting lost in gym bags and hiking equipment, a wire clamp, premium foam ear tips and regular ear tips. Hussar is compatible with iPhone, Samsung Galaxy, Windows phone, ipad mini, and Alienware laptops. These Best Sport Bluetooth Headphones are so comfortable and secure that you’ll forget you’ve got them on while you doing yoga, working out, hiking, or even sitting at your computer.